Last week saw a remarkable turn of events in the campaign to stop the public from knowing just how elected law enforcement offices have come to be used by the Climate Litigation Industry, to promote a campaign pushed by plaintiffs’ lawyers, activists and major political donors. 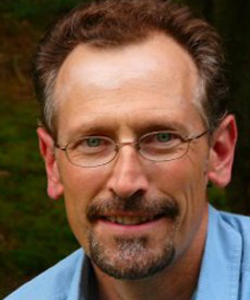 On behalf of CEI, on January 17, 2019, GAO’s Chris Horner requested emails from January through mid-April, 2016 between key Climate Industry figures and two senior Massachusetts Attorney General officials, Christopher Courchesne and Mike Firestone. These included correspondence to or from the plaintiffs’ lawyer Matt Pawa and activist Naomi Oreskes. As records posted on ClimateLitigationWatch.org show, Courchesne was an active correspondent in the emails among OAG staff organizing the March 29, 2016 press conference in Manhattan with “green” investor Al Gore. There, 20 AGs vowed to use their law enforcement positions to advance a climate agenda that had failed through the proper, democratic process. Firestone is AG Maura Healey’s Deputy. Public records show that, on her behalf, he is running recruitment for activist OAGs to place privately funded “Special Assistant Attorneys General” for climate in the scheme run by billionaire activist Michael Bloomberg. Any such records would be of tremendous public interest, and would help further establish the specifics of how plaintiffs’ lawyers and activists were able to enlist law enforcement in their scheme. This is absurd on its face for reasons including, as Horner noted in appealing the move, that Massachusetts’ law not only requires agencies to release any segregable materials and redact legitimately exempt information, if there is any — revealing, e.g., the To, From and Date cannot possibly prejudice law enforcement. 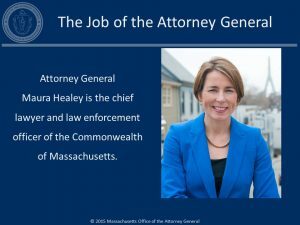 Maura Healey is the chief lawyer and law enforcement officer of the Commonwealth of Massachusetts. Source: Massachusetts Office of the Attorney General. It would of course gravely embarrass Healey, who purportedly is readying a new round of subpoenas of opponents of the climate agenda, picking up where America’s Sweetheart Eric Schneiderman left off when chased from office. We link to the entire record, below, so you can examine for yourself, but Massachusetts’ law not only requires agencies to redact, and release any segregable information (like the to, from and date fields, typically the Subject field, and more); it also defines investigative materials. As does ample judicial precedent. And it is implausible that what MA OAG Healey is hiding here is that. Regardless, if it is, she has yet to demonstrate that is so, which is her burden if she chooses to hide anything. As the Massachusetts Secretary of State’s Supervisor of Records made clear, not once but twice. We can give you no further information about these records without compromising our investigation or litigation strategies to the same extent as disclosing the records themselves. The senders and recipients, the dates, and the content of these e-mails relate to our ongoing ExxonMobil investigation, or, in one instance, other potential environmental enforcement, and, if released, might not only prejudice the investigation going forward, but would also likely impact the related litigation. CLW commends the record itself to readers, which illuminates the frivolity of the claim that releasing emails between an AG’s team and a plaintiffs’ lawyer and/or academic activist, who boasted about needing “a single sympathetic attorney general” to kickstart their own litigation campaign — even with absolutely everything redacted but just the To, From and Date — could threaten law enforcement. For example, OAG has now already admitted the relationship, and that it is partially documented by emails. What even just the To, From and Date would do, however, would be to provide the public with tangible information, in documentary form for wide dissemination, showing the 2016 scheming behind recent past abuses, and the supposed new, coming onslaught by MA’s AG (and surely her Doppelgängers). Embarrassment and disgrace, however, are not exemptions under any open records law, particularly not Massachusetts’s, which thanks to recent amendments is fairly robust. Which brings us to the appearance of rather desperate intrigue. Horner again appealed, again pointing out the law and the facial absurdity of that position that had every appearance of seeking to avoid political embarrassment. On Monday, April 8, 2019, the Secretary of State’s Records Officer expressly noted the claims of investigation and litigation in her opinion again ordering OAG to get right with the law, which she also explained, again. She mentioned OAG’s litigation argument, four times. In three pages. And she dismissed it, rightly, as not changing the law. Although the AGO has identified there are “six (6) pages of e-mails” responsive to Mr. Horner’ s request and indicates release of the records “might not only prejudice the investigation going forward, but would also likely impact the related litigation,” it remains unclear why the AGO is withholding the records in their entirety. That was Monday. One might expect that this likely did not land well in the Massachusetts Office of the Attorney General. By Wednesday, the same Supervisor of Records wrote again, having had an epiphany. It seems at some point after writing her Monday opinion the Supervisor of Records realized she failed to consider OAG’s claimed fear that releasing its emails with plaintiffs’ lawyers and/or activists would “impact” ongoing litigation. The argument she referenced four times. the Supervisor may deny an appeal for, among other reasons if, in the opinion of the Supervisor: 1. the public records in question are the subjects of disputes in active litigation, administrative hearings or mediation. Whereas the requested records at issue in this appeal relate to the subject matter of a pending litigation involving the AGO and ExxonMobil, I find these records are the subject of dispute in active litigation. Therefore, I decline to opine on this matter….Accordingly, I will now consider my April 8, 2019 determination void and this determination dated April 10, 2019 in effect. This administrative appeal is now closed. That is, after opining on the matter on Monday, by Wednesday the Massachusetts Records Supervisor decided she had overlooked an argument that she expressly considered (and rejected) and, since — if she found it valid — she could deny the appeal on that basis, she would…decline to opine. Massachusetts now seeks to Hide the Opine. OAG’s admission of six pages of correspondence with these principals in the climate litigation industry was brilliant; indeed, the abuse of office that this hints at is so great, one can reasonably assume OAG intended to go to the mattresses to fight release. OAG getting smacked down on Monday was even better. But the Wednesday effort to pull it back was, as the Danes say, “honey on the sausage”. What transpired, we do not yet know, of course. The appearance however is unmistakable, that someone in the Massachusetts Office of the Attorney General contacted someone in the Massachusetts Secretary of State’s Office, at the level of Supervisor of Records or higher, expressing a certain…concern about a civil servant who it does seem was just trying to do her job. Possibly some influential he or she from OAG emphasized that the Supervisor of Records was, like young Louis Winthorp in Trading Places, “making a career decision here”. Possibly we will find out. We do understand that subsequent requests have issued seeking to learn who (if anyone) called, texted or emailed whom between Monday’s proper opinion and the remarkable Wednesday “nevermind”. In the meantime, it is inarguable from AG Healey’s Office’s own missives that that Office was, indeed, working early on with plaintiffs’ lawyers and/or an activist who had pleaded for some, sympathetic AG to use their office to jump-start a climate litigation industry against opponents of the climate agenda. This episode reminds us of one reason that post-Watergate legislatures enacted open records laws in a flurry — with power comes the abuse of power. Which various state attorneys general have gone to great lengths to make sure no one forgets any time soon. The records request also covered two West Coast plaintiffs’ firms that subsequently became involved, but are far less likely to have been working with MA OAG at that time as these two just down the street in Cambridge, MA). It is therefore reasonable to assume any responsive correspondence OAG admits to is with them. CLW welcomes any release to clear that up.